But before experiencing "Common Sky," a monumental sculpture by Danish-Icelandic artist Olafur Eliasson that will enclose a new public gathering space, art fans will suffer a period of withdrawal from the Clyfford Stills and Picassos they know and love. The gallery's buildings will close for at least two years when the museum breaks ground on its long-planned expansion and renovation project at the end of the year. 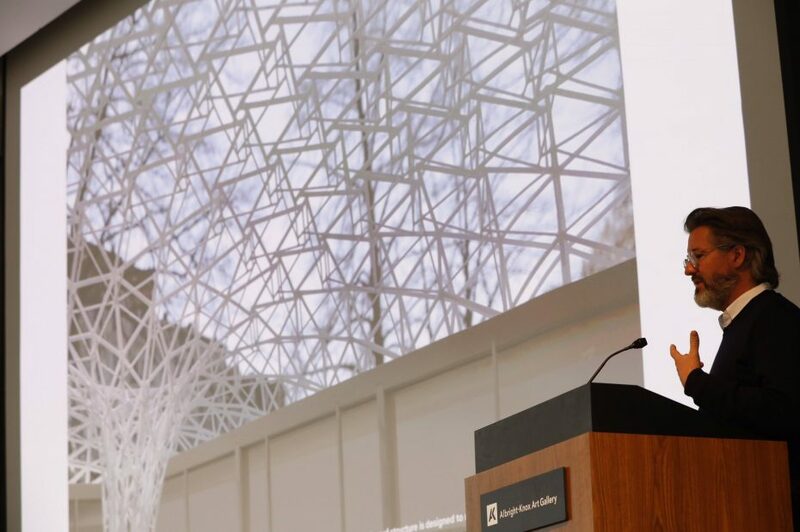 "We have conducted extensive research on the costs and benefits of keeping portions of the museum campus open during construction," Albright-Knox Director Janne Sirén said during Thursday's announcement in the Albright-Knox auditorium. "Given that the museum will be an active construction site, operations here at the Elmwood Avenue campus will begin to wind down as we approach groundbreaking toward the end of this year." Construction is expected to begin in November, according to Albright-Knox Communications Director Maria Morreale. While much of the gallery's staff will continue to produce exhibitions and events in the community and plan for the museum's reopening, Morreale said about 10 full-time staff positions and several part-time positions would be affected by the construction period. The new space on the East Side, while not appropriate for housing the gallery's famous paintings and sculptures, will serve as a project space for installations and exhibitions that are not dependent on museum-level climate control. "We're really excited to be a part of this neighborhood," said Albright-Knox board president Alice Jacobs. "It's a critical effort in the economic renaissance of Buffalo, the development of this Northland corridor, and it really speaks to our strategic plan of wanting to engage other areas of the community." There are no current plans to tour the masterworks from the gallery's collection as it did in 2014, curator Cathleen Chaffee said. Instead, museum staff will use the construction period to perform conservation, framing and photography of those pieces so they're ready for their reintroduction in 2021. The gallery's partnership with the City of Buffalo and Erie County on public art, Jacobs said, will expand during the construction process, with specifics to be announced later this spring. The gallery is also launching an art truck in spring 2020, which, according to a release from the gallery, will "drive creativity throughout Western New York" with an array of activities, classes and projects. The monumental new artwork that will bubble up from Gordon Bunshaft's 1962 addition, called "Common Sky," features a geometric network of clear and mirrored glass that descends into a funnel connected to the ground. In that way, the sculpture will allow snow and sky to penetrate the space — at least visually — giving visitors a sense of connection to the outside environment while being insulated from its chill. The shape of the piece was inspired, Eliasson said, by the way snow piles up into drifts on a windy day. 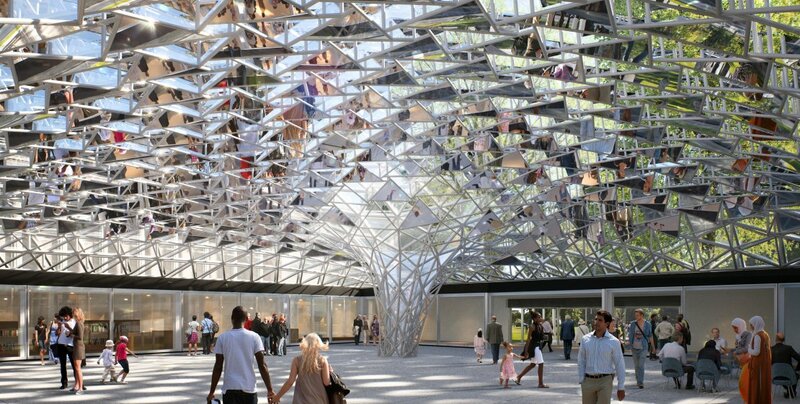 "I really wanted to give the quality of light in the room a kind of spectacular quality," Eliasson said, prompting a round of applause from the crowd as he displayed a detailed rendering of the planned space. "As you walk through the space, you will see yourself in a small reflection in the sky. Seeing yourself in the context of the sky suggests that there are no limits to where we should be imagining ourselves." The gallery's expansion plans have been germinating for more than a decade, taking various forms as gallery leaders and architects contended with fundraising, preservation and practical challenges. 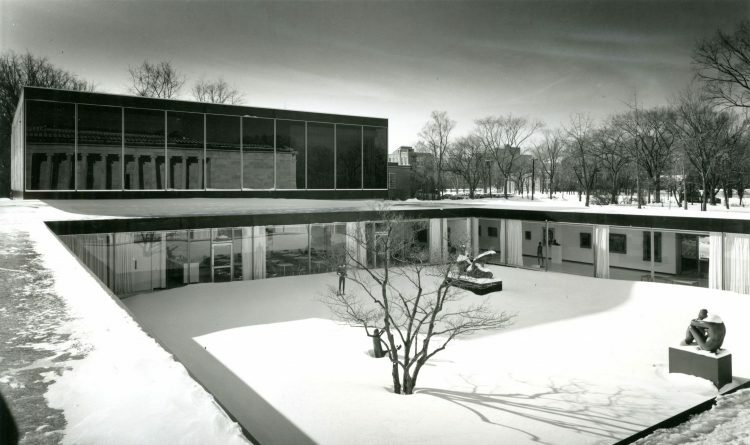 Opposition to the gallery's initial expansion plan, which called for radically altering architect Gordon Bunshaft's sleek 1962 building into a sprawling public indoor space, pushed the gallery toward the current plan. That plan calls for a new, semi-transparent building on the northeast end of the museum's campus with about 30,000 square feet of new gallery space. 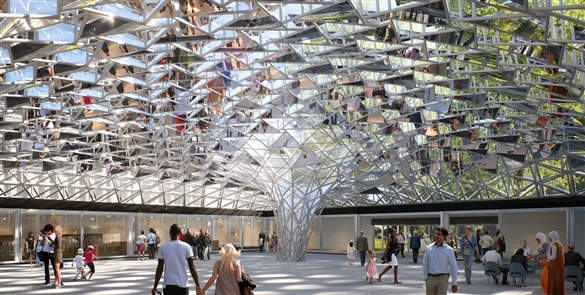 The building will connect to the gallery's original 1905 building via a winding "scenic bridge." And the current parking lot along Elmwood Avenue will be buried and replaced with an open lawn, restoring an important part of Frederick Law Olmsted's Delaware Park. The project also will restore a reimagined version of the west stairs that existed when the original building opened in 1905. Will preservationists change course of AKAG expansion? What's so bad about the Bunshaft? Shohei Shigematsu, the lead architect for the expansion project, unveiled several new renderings of the planned building and scenic bridge. The new building on the campus' north side will feature a double-height gallery at the entrance and a cross-shaped core of gallery spaces surrounded by transparent public spaces, offices and other functions along the transparent outside corridors. New, underground parking will connect visitors directly to gallery entrances in the new building and the current 1962 building. "It really represents the rich history of architectural ambition of Buffalo, and I’m of course very honored to be part of it," Shigematsu said. "I also wanted to point out the resonance or similarity in terms of the architectural gesture between the north building and Olafur’s roof, which both have a great ambition to actually welcome people and have space for people to produce and invent and interact." Eliasson and architect Sebastian Behmann's newly commissioned covering for the gallery's courtyard, currently empty of art and visitors, will enclose an indoor plaza that will function as a free community gathering and event space. Visitors will be able to enter from the east and west sides of the campus, creating a pass-through for park visitors and a funnel into the broader museum. "We envision this new space as a global destination and as an epicenter of cultural and social activity in Western New York," Janne Sirén, director of Albright-Knox, said on Thursday. Funding for the project, now projected to cost $160 million, with $131 million already in hand, has been driven largely by the Amherst-born philanthropist Jeffrey Gundlach, a billionaire bond trader who has committed $52.5 million of his own fortune to the expansion. Upon its completion in 2021, the gallery will be renamed the Buffalo Albright-Knox-Gundlach Art Museum, or Buffalo AKG for short. Gundlach has given Western New York "the courage and the jet fuel" to accomplish the project, Sirén said. The plan drew rave reviews from observers in the crowd and public officials including Mayor Byron W. Brown and Erie County Executive Mark Poloncarz, who praised the inspiring words of a young art fan named Isaac, the star of a new promotional video the gallery screened on Thursday. "When I heard the words from Isaac, it just reminded me why we do these types of projects," Poloncarz said. "We do them not only for our own enjoyment, but we do them so when people walk in here in the future, they realize that this is a community that cares about the rest of the community, and this is a community that says to the rest of the world, not only do we matter in the art world, we matter for everyone."